Physicists around the world were puzzled recently when an unusual bump appeared in the signal of the Large Hadron Collider, the world’s largest and most powerful particle accelerator, causing them to wonder if it was a new particle previously unknown, or perhaps even two new particles. The collision cannot be explained by the Standard Model, the theoretical foundation of particle physics. 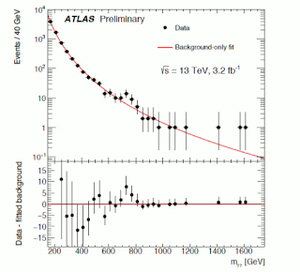 Adam Martin, assistant professor of physics at the University of Notre Dame, said he and other theoretical physicists had heard about the results before they were released on Dec. 15, and groups began brainstorming, via Skype and other ways, about what the bump could mean if confirmed — a long shot, but an intriguing one. He and some collaborators from Cincinnati and New York submitted a pre-peer-review paper that appeared on arXiv.org on Dec. 23. 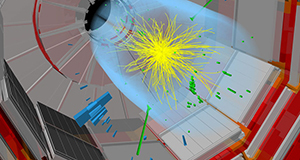 The paper considers four possible explanations for the data, including the possibility that it could indicate a heavier version of the Higgs boson, also commonly known as “the God particle.” Further research could yield mundane explanations, Martin says, and the excitement could fade as it has many times in his career. Or it could open up new insights and call for new models. Authors of paper, “On the 750 GeV di-photon excess,” are Martin, Wolfgang Altmannshofer, Jamison Galloway, Stefania Gori, Alexander L. Kagan and Jure Zupan. Originally published by Gene Stowe at news.nd.edu on January 08, 2016.